Chagas disease, also called American trypanosomiasis, is caused by infection with the parasite Trypanosoma cruzi. The parasite is primarily transmitted to humans by triatomine bugs (commonly known as kissing bugs). Although most infected with the parasite remain without symptoms, about 20-30 percent will develop serious complications making it a significant public health concern. About 8 to 10 million people are infected with T. cruzi worldwide, most of whom are unaware of their infection. Areas with high rates of Chagas disease include Mexico, Central America and South America. It has been estimated that more than 300,000 persons are infected with T. cruzi in the United States, mostly as a result of immigration from countries where Chagas disease is common. Although the triatomine bug is found in the southern U.S., local transmission is thought to be very low. 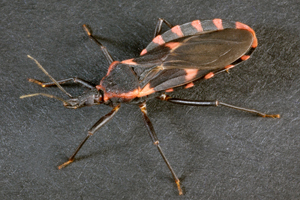 Transmission through a bite from the triatomine bug is the most common way of getting Chagas disease. The T. cruzi parasite is present in the bug’s feces. The parasite can enter a human or animal when the bug defecates on the skin during or after its blood meal, allowing the parasite to enter through the bite wound. The parasite also can enter directly through the conjunctiva (eye) and other mucous membranes. Triatomine bugs live indoors in cracks and holes of inadequate housing, such as mud walls and thatched roofs, so individuals living in rural areas of endemic countries are most at risk. Chagas disease can also be transmitted from mother to baby during pregnancy (congenital infection). It is estimated that 1 to 10percent of infected mothers will transmit the parasite to their infants. Only one case of mother-to-child transmission has been reported in the United States, however, about 63 to 315 unrecognized cases are estimated to occur each year. Another mode of transmission is through blood transfusion or organ transplantation. 19 cases of transmission through organ transplantation and five cases of transfusion-associated Chagas disease have been reported in the U.S. Since 2007, blood banks in the United States have screened for and discarded blood donations testing positive for Chagas disease. Other less common forms of transmission include oral transmission through undercooked food contaminated with T. cruzi and laboratory accidents involving work with the parasite. Chagas disease has an acute and chronic phase. During the acute phase, most people have no symptoms or experience a non-specific, mild febrile illness. Other symptoms include eyelid swelling or swelling at the bite wound. Rarely during the acute phase, an infected individual can rapidly develop myocarditis (inflammation of the heart muscle), heart failure or meningo-encephalitis (inflammation of the brain and its lining). The acute phase lasts about two months after infection. During the chronic phase the parasite hides mainly in the heart and digestive muscles. Although most infected individuals never exhibit any symptoms, about 20 to 30 percent will develop more serious and life-threatening medical complications during the chronic phase. These can include heart failure, arrhythmias (irregular heart rhythm), and gastrointestinal complications such as megaesophagus (dilated esophagus). A complete medical history, which includes asking about possible exposures (e.g. residence in or travel to endemic countries, blood transfusions.). Blood tests to look for the parasite or for antibodies in your blood. An echocardiogram and/or barium studies of the esophagus or colon, if indicated. If you think you have Chagas disease (e.g., if your blood bank notified you of a positive test result), please see a health care provider. Your health care provider can contact the U.S. Centers for Disease Control and Prevention (CDC) for further guidance and access to Chagas disease medications, if needed. CDC services are available by phone at 404-718-4745 or by e-mail at chagas@cdc.gov. If you have been diagnosed with Chagas disease, you should not attempt to donate blood. Can Chagas disease be treated? They could have been infected in the same way you did (e.g., residence in endemic countries). You were pregnant while you were infected. They received a blood or organ donation from you after you were infected. There are other reasons you think they might be infected. No drugs or vaccines for preventing Chagas disease are currently available. Triatomine bugs often live in poorly constructed buildings, such as those made of mud walls and thatched roofs. Improving housing conditions and using insecticides inside homes have decreased the spread of the disease in endemic countries. In the U.S., efforts to prevent Chagas disease are targeted at blood transfusions, organ transplantations and reducing mother-to-child transmission. Am I at risk of Chagas disease during travel? Risk of Chagas disease for short-term travelers to endemic areas (Mexico, Central America and South America) is very low. Travelers can reduce their risk of infection by sleeping under insecticide-treated bed nets and staying in well-constructed accommodations. CDC services, including physician consultation regarding testing and treatment, are available by phone at 404-718-4745 or by e-mail at chagas@cdc.gov. For more information on Chagas disease, please visit the CDC website at http://www.cdc.gov/parasites/chagas/. For health care providers needing further guidance on the evaluation and treatment of Chagas disease, click on this link to the review article Evaluation and Treatment of Chagas Disease in the United States: A Systematic Review (JAMA 2007: 298:2171-81).